We've been talking a whole heap about winter traditions and winter events here at UH, but couldn't we all use a little jolt of summer fun as we dip closer and closer to the longest night of the year? Villages and towns all over the world often host festivals, outdoor amusements and sporting events during the summer months, capitalizing on warm weather, high spirits and short nights. Lest you think that the modern Olympics has cornered the market on multi-sport competitions, might I turn your gaze eastward, toward Mongolia, and the traditional naadam festival. The festival dates all the way back to the 3rd century BCE. After an opening ceremony of music and dancing, the competition begins. Wrestling is a hugely popular event. (Again, look at the costumes.) Men from all parts of Mongolia travel to compete. There are no weight divisions, meaning a big man can go toe-to-toe with a smaller man, and no time limits on bouts. The loser is the man who falls first. Bouts can happen very quickly, or seem to take a very long time as the wrestlers look as if they are standing in an embrace, waiting for the perfect opening to throw their opponent. Then the winner performs the "eagle dance" as his defeated opponent takes off his jacket and walks under the winner's outstretched arm. Mongols come from a nomadic tradition which is still very much part of Mongolian life. In order to cross huge expanses of steppe, horses are essential, and it is often said that a Mongol child first learns to ride before he or she can walk. Genghis Khan and his descendants relied on their expert horsemanship to create and maintain their vast empire. So it's no surprise that horseback riding is part of the naadam. Horses are ridden cross-country, with the length of each race determined by the horses' age class. The true competitors of the horse racing event are the horses, not the jockeys. In fact, most of the jockeys are between the ages of five (yes, five) and thirteen, ensuring their smallness so as not to tire the horses. Feasting inevitably surrounds the races as spectators eat and cheer their horses to victory. 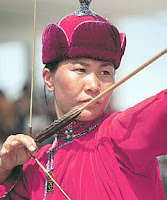 Archery is another key Mongolian sport. Bow hunting and bow-based warfare are both vital historical aspects of life on the steppe. At the naadam, men and women compete in separate divisions. All the competitors dress in traditional dress. Unlike modern archers' use of compound bows, Mongols vying in the naadam use recurved composite bows of horn, leather and bark. Arrows are made of willow branches with vulture feather fletching. They shoot at round, leather targets. Men stand 75 meters and women 60 meters from the targets. Nearby judges evaluate each shot with a shout of "uukhai" ("bull's-eye") and a raised hand. Winning archers are those who hit the targets the most times. 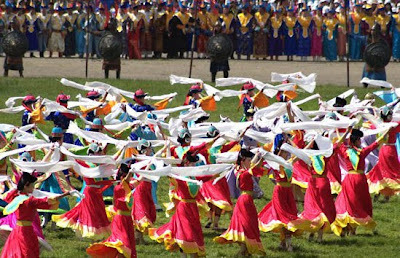 Accompanying all these competitions are, of course, celebrations, music, games, dancing and feasts--all the things Mongols love, and they take special delight in celebrating during the brief summer. 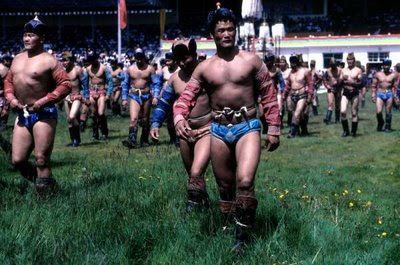 When I began researching Mongolia for my upcoming "Blades of the Rose" novel WARRIOR, I learned about the naadam. The whole festival captured my imagination, being so emblematic of Mongol life and culture. I knew I would have to incorporate the naadam into WARRIOR's plot--and I did, but I can't reveal just yet how the festival plays an important part in the story. For that, you'll have to read the book. Until its release next September, stay warm and dream of competing on the wide, grassy steppe beneath the eternal sky.